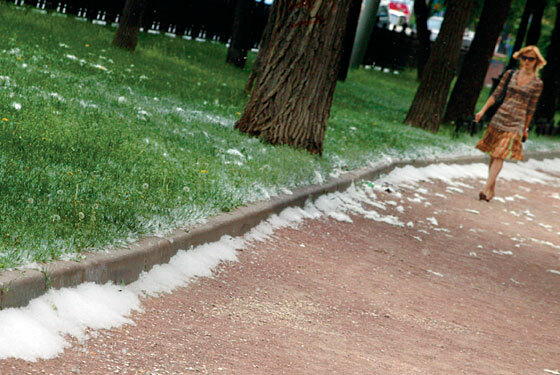 Every year, just as the heat has finally set in, Moscow is rendered wintry once again—by poplar fluff. It gathers in snowlike drifts and unleashes fearsome allergies. Khrushchev is to blame. His postwar plan came with its own green initiative: By the mid-sixties, the city was home to 400,000 black poplars, or one for every sixteen people. The perfect city tree, it absorbed up to four times as much carbon dioxide as other breeds. But poplars come in two genders (the males produce pollen, the females fluff), and nobody bothered to check if all the trees were male—or, for that matter, to learn that excessive cutting of a tree’s top can make a male so desperate to reproduce that it changes gender. The result sings with irony: The city famous for its six-month winter got three extra weeks of blizzard.